(Note – SBH – I am uncertain from which site the Ayrshire Bauxitic Clay Company Ltd operated from). Ayrshire Bauxitic Clay Company Ltd – The Parliamentary papers of 1883 record the Doura mine being worked by John Barr, with Thomas Rigg as his manager. Slater’s Directory of 1889 notes Robert Armour as the proprietor of the Doura Fireclay Company. 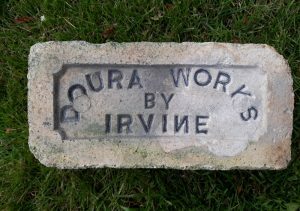 The name changed again in 1907 to the Doura Coal and Fireclay Company, but Robert Armour was still the Managing Director. The surface fireclays in this area are extremely variable, but below them lie the more valuable bauxitic fireclays, which were only recognised for their potential re-fractoriness after 1912. in the 1920’s they were worked on an experimental basis by the A.B.C. Syndicate, which compromised the partners, John Shields of Derby, Thomas Kyle of Galston, and Frank Russell of Worksop, who was building up the fast growing General Refractories of Sheffield. On 8th May 1930, the partners met at Galston and adopted Articles of Association to form the Ayrshire Bauxitic Clay Company, with a capital of £2,000. Sir Thomas Cunninghame of Kirktonholm had granted them a lease for 21 years at a fixed rent of £35 a year, or at his optional royalty of 9d per ton of bauxitic clay, 4d for coal, 3d for fireclay, and 6d for sandstone. These figures show the importance of bauxitic clay. General Refractories soon took over the manangement of the company, and sent the bauxitic clay to the nearby rail sidings for transport to Glenboig, while the best of the top fireclay was sent to their other subsidiary, Henry foster. 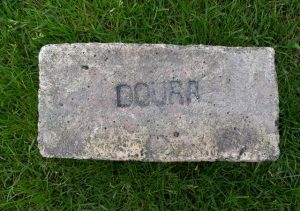 The remaining top fireclay was sold at 6d per ton to the local Bourtreehill Fireclay company. This was a very low price as mining costs were 7/2d (36p) per ton in wages, and 1/11d (10p) for timber, rails, and stores. In 1934, Frank Russell on behalf of General Refractories offered the other partners to build a kiln on the site to calcine the bauxitic clay, subject to a 5% interest charge on the money expended and repayment over ten years. This was agreed, and to help the company, Frank Russell placed a 100 ton order for the best top fireclay at 7/6d (37p) per ton for delivery to George Turnbull’s Dykehead works at Bonnybridge, which had just been bought by general Refractories; and a further 100 ton order for Henry foster at a special discount of 25% to help them with a cut-price order that they had taken. Ayrshire Bauxitic Clay – An allochthonous deposit? – S.K. Monro, F.C.Loughnan and M.C. Walker. Ayrshire Bauxitic Clay Company Limited. – (Members’ Voluntary Winding-up.) At an Extraordinary General Meeting of the above named Company, duly convened and held on the 22nd January, 1951, the following Special Resolution was duly passed: — “That it is desirable to amalgamate the Company with the Glenboig Union Fire Clay Company Limited, and accordingly that the Company be wound up voluntarily and that Douglas Clark Ford, Chartered Accountant, of Star Works, Glenboig be and is hereby appointed Liquidator for the purpose of such winding-up.” A. McKendrick, Director. 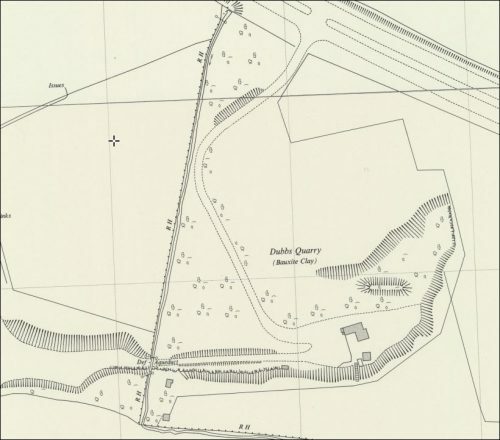 Associated Info – Glebe Quarry, Saltcoats. Ayrshire. Small-scale quarrying of the Ayrshire Bauxitic Clay. The clay occurs at the top of Millstone Grit (Carboniferous age) lavas. 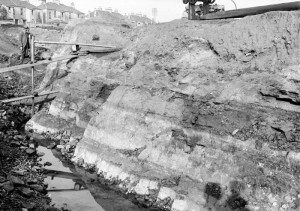 The quarry face extends about 100 yards and further north-east the seam could be traced in the sides of the railway-cutting between the Caledonian Station and the Raise Road. A small mine occurred in a field corner at the northern end of the Raise Road. The seam has been traced from Saltcoats to near Kilmarnock, a distance of almost 15 miles and is by no means homogeneous. It is made up of a series of lenticular patches of different materials which have no great lateral extent and are of widely varying composition. 1938 – Ayrshire Bauxitic Clay Company Ltd. 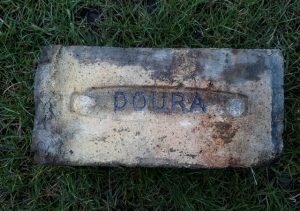 Mine named – Doura (Fire clay); Situation – Mountgreenan; Manager – M Rorrison. 6 employees below ground; 2 employees above ground. 31/03/1898 – Glenvault Fire Clay Mine, Dumbarton. Owner George Turnbull & Co – accident – casualty Adam Taylor ( 44) Overman – a spark off his naked light ignited 14lbs of gunpowder illegally stored in the mine. Woodlea Brick and Tile Works, Bonnybridge. Found by Tucker Kennedy in the Ayrshire area. Brick & Tile Works, Doura, Irvine, Ayrshire. . . . .
Found at The Doura Fire Clay Works site. Doura Fire Clay Works. Fire Clay and Composition bricks, Kilwinning. . . . . .